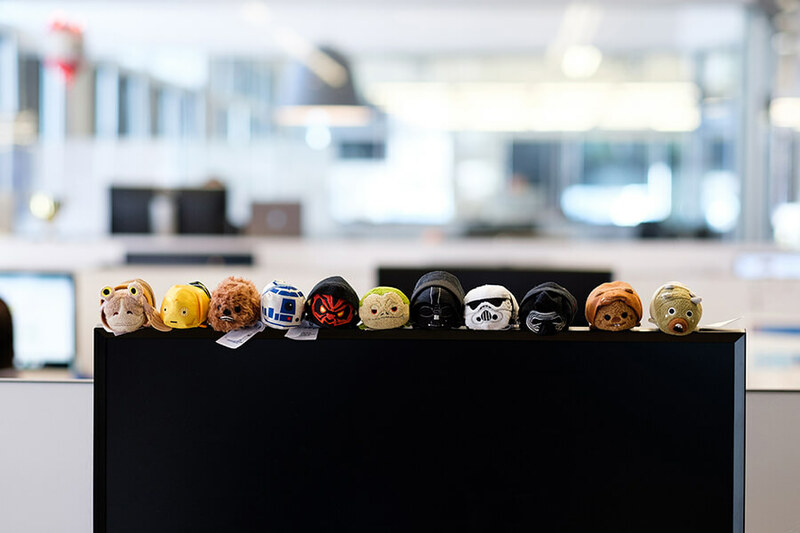 Account Executives at Qualtrics develop an unusually wide range of skills. AEs are responsible for the full sales cycle — from prospect to close — and because the Qualtrics platform is so flexible, they must be comfortable selling to an almost limitless array of decision makers, in Marketing, Sales, Engineering, and beyond. To learn about the experience first hand, we spoke with four team members – George Saadeh (Sr. 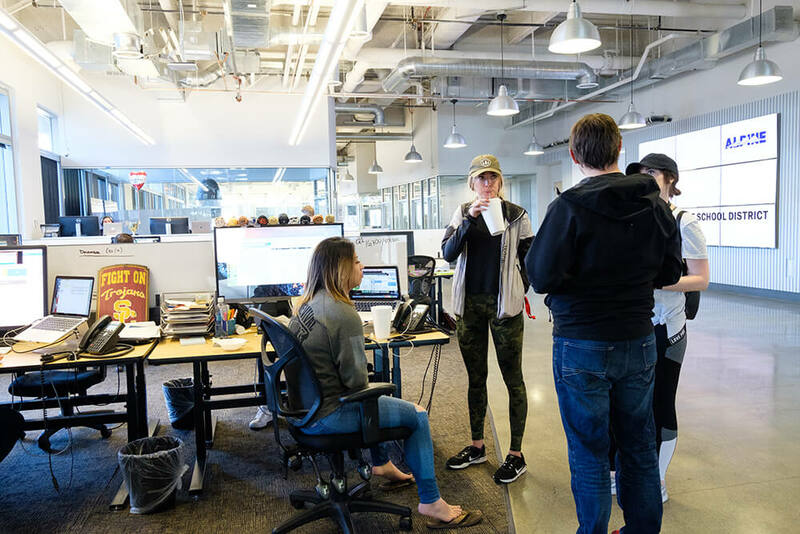 Manager, Corporate Sales), Melissa Nock (Sr. Account Executive, Corporate Sales), Abraham Darais (Manager, Corporate Sales), and Kelsey Brooke (Account Executive, Corporate Sales) about the Sales team’s training, culture, and rapid growth. Speaking of which — the team is hiring! Check out open roles to learn more. Left to right: Melissa, Abraham, George, and Kelsey. Let’s start with the basics: What are you selling and who are you selling it to? Melissa: Essentially, Qualtrics is an extremely robust research and Experience Management platform. Clients use our SaaS platform to gather, analyze, and act on data that gives them insight and the ability to improve the four core experiences of their business — customers, products, brands, and employees. 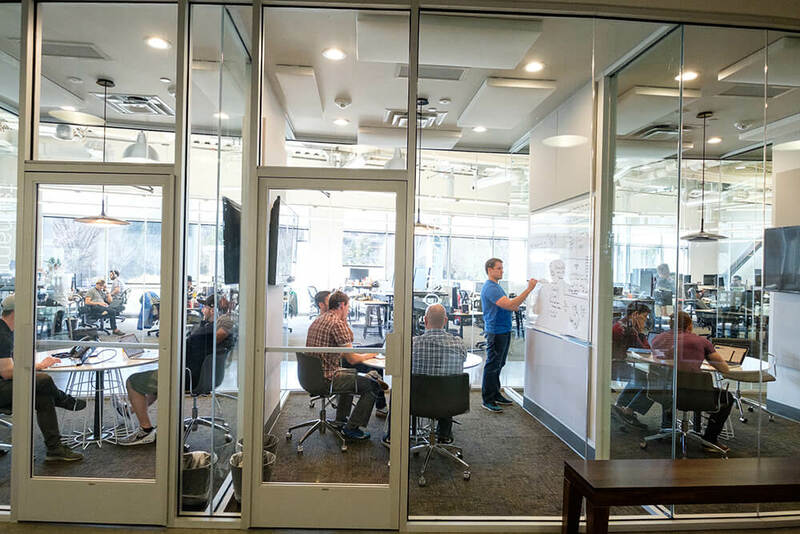 We help our clients monitor and respond to every aspect of their business, and they use insights gathered through our platform to do things like improve employee engagement and optimize their products. George: We work with a wide spectrum of companies, both in terms of the industries they’re in and their background with experience management. We’re lucky to have an interesting mix of prospective clients; some understand exactly what we do, and others need a more comprehensive explanation of how we can help their bottom line. 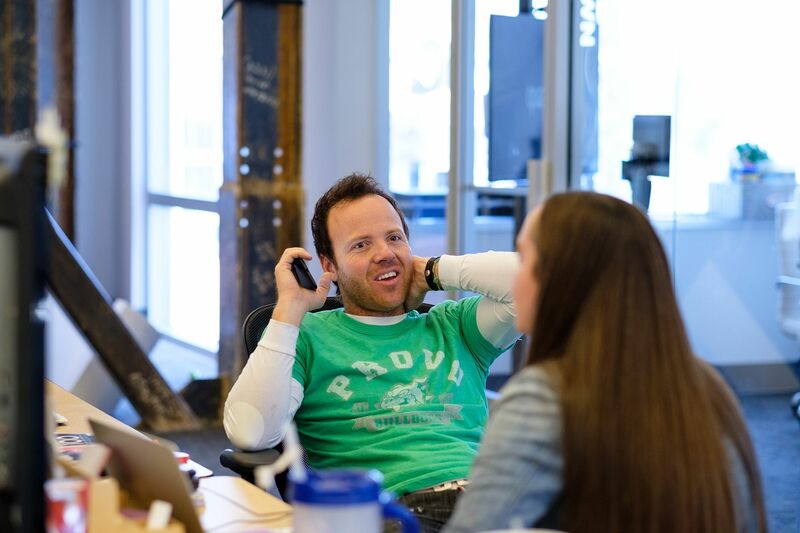 How is selling Qualtrics different from other sales jobs you’ve had? Abe: We’re selling something businesses are genuinely looking for, and that’s rewarding. Qualtrics is in a good market, in an industry where there’s a lot of demand. People know the brand. But we’re not resting on our laurels in Sales; we believe in our product and we want everyone to know why. George: The length of our sales cycle is also different. 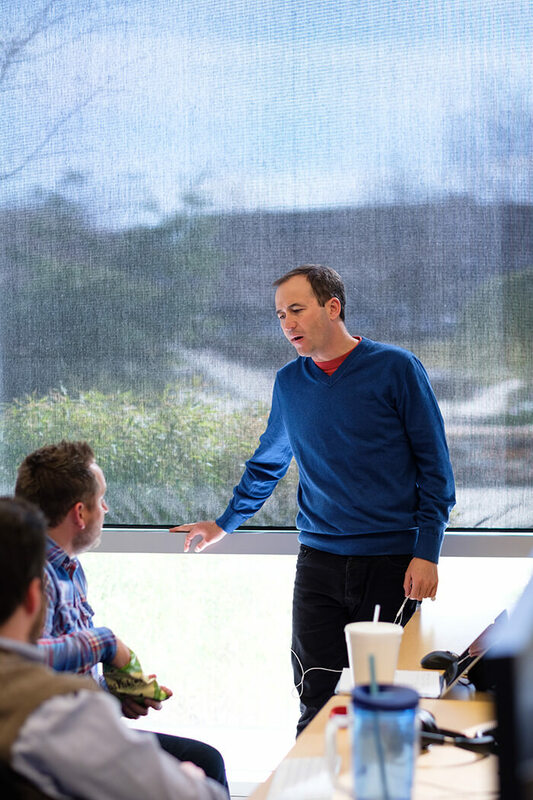 Qualtrics has evolved a lot as a company; our solutions are more complex than they were five years ago, and so our sales are more consultative, too. Our platform can be useful to multiple departments in the same company — Marketing, Sales, Product, HR — so you need more expertise as a salesperson, and the cycles can be much longer. That’s exciting, though, because we are able to build lasting relationships with our clients. It also means every salesperson here has comprehensive knowledge of the product, since we can’t get away with anything less. 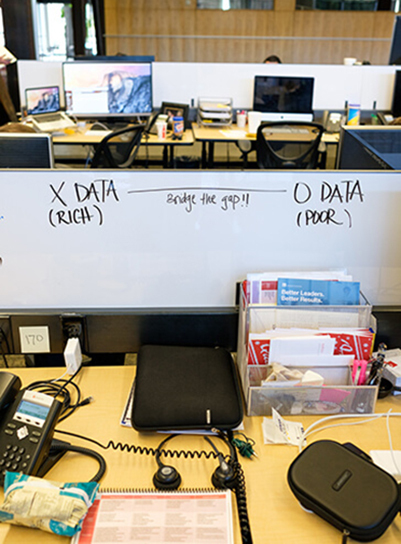 Above: Most team members sit at desks near the windows (background). About a dozen conference rooms are scattered around the workspace. Above: The couches near the main atrium are a prime spot for conversation. Below: Or skip couches and just say hi. Tell us about training. Can you describe the learning curve, and the transition from Sales Development Representative (SDR) to Account Executive (AE)? George: Our training is definitely unique. When Sales takes on a new team member, we’re responsible for helping that person develop and grow. We do formal trainings that are specific to selling our product, but we also have multiple levels of mentorship. A new employee gets a mentor, an associate manager, and is also connected with the regional lead. So multiple people are dedicated to making sure that one person is successful. Mentees get a ton of support; we do one-on-one sessions and group training, but their mentors also join them in on- and off-call situations to give feedback in real time. Kelsey: That support is part of the reason we can transition so quickly within sales. I was an SDR for three months before I was promoted to AE, and that time was extremely valuable. Coming straight from school, even cold-calling was mildly uncomfortable for me at first. But I learned so much from working with different reps; I’d see one with a much looser conversational style, another more regimented. That carried over when I started having those conversations myself. Melissa: I’m different because I came in as an AE rather than an SDR, so I didn’t go through our sales training initially. I had the sales background, but I still needed to learn how to sell Qualtrics, which is different from selling anything else. George was my mentor when I first came on. I learned by watching him; I’d sit in on his meetings and he’d sit in on mine. Even beyond the multiple mentors, every team and every employee here is equally open to helping you. And everyone’s approach to sales is going to be a little bit different, so you get various points of view. Can anyone else speak to their trajectory, where they’ve gone within Qualtrics? 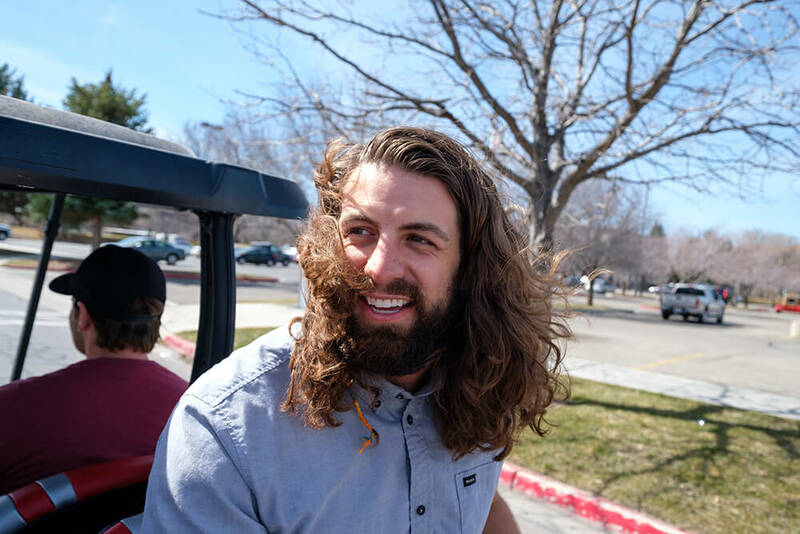 George: I started at Qualtrics in an entry-level sales role, and the people who hired me explained that you can dictate your whole career path if you kill it and hit your numbers. I thought that was a pipe dream, but it came true: I worked hard, brought on new brands, sold to existing clients. About a year and a half in, I took my first management role. My team has grown from there and hasn’t stopped. Abe: I started in sales development. At the time, that was a few steps back for me in terms of title, but I was so into Qualtrics I had to take the opportunity. I was an SDR for three months, like Kelsey, and I hit my targets and moved on to AE. After about two and a half years in that role, I became a team leader. Kelsey: The internal transitions were a lot harder than I anticipated, honestly. In sales development, you struggle for the first three weeks, but then you get in the swing of things. Then, all of a sudden, you move into sales and it’s uncomfortable again. Eventually, you get it down — then comes another challenge, like helping mentor someone else or taking on more responsibility. So you’re always growing; you’re not allowed to stay comfortable. It’s consistently challenging, which is unique and awesome. Top left: Yes, this is what a sales call (sometimes) looks like. Top right: Qualtrics’ CEO, Ryan Smith, has a background in sales. Below: Calls, calls, calls. As AEs, you don’t rely solely on SDRs for leads, right? Why do you think it’s important to do some prospecting yourself? George: I see prospecting as the way companies grow. It adds value for yourself and your company when you can create something from nothing. If you’re just taking leads, there’s going to come a day when those leads dry up, and you’re stuck. But if you can learn, and become good at, every aspect of sales, then there’s no scenario, no company, no industry where you can’t be successful. Melissa: Prospecting is hard. It’s uncomfortable. It’s definitely not my favorite part of the sales process, but it’s also rewarding to do everything from start to finish, from prospecting to selling and managing the account. Abe: Maybe I’m the odd duck on this, but I actually enjoy prospecting. I like being part of the whole process and finding new clients who weren’t necessarily seeking out Qualtrics; actively changing that means I’m contributing to the company in ways I wouldn’t otherwise experience. Tell us more about the sales cycle. What’s it like to sell this platform, day to day? George: You start by calling a lead. You could be talking to Chief Customer Officer or a VP, or maybe someone lower. First, you’ve got to figure out their current landscape, their desired outcomes, how Qualtrics can help, their timeline, and their budget. Then, you’ve got to figure out how they procure software, who is involved, and what the process looks like. 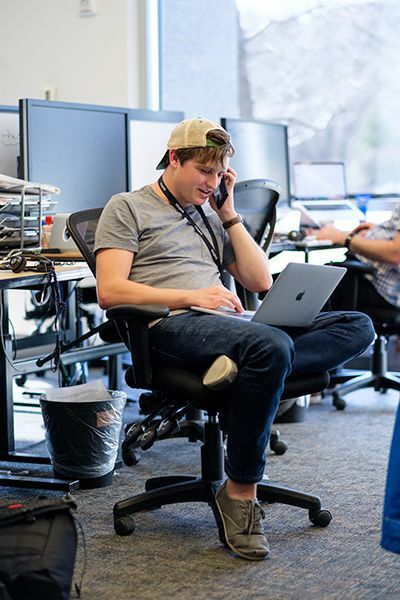 And because Qualtrics is a complex solution, we keep working with various departments — IT, legal, sales — even after a verbal commitment, and each of those requires review. End-to-end, the average deal cycle is typically two to three months. The length varies; sales cycles can sometimes be as long as 12 to 18 months. But that’s something that comes with growth as a salesperson and with bigger deals, and that’s exciting. Abe: One of the attractive things about the longer cycle, too, is that through every stage you’re refining yourself holistically as a salesperson, which translates into success for your entire career. Being more well-rounded will help you here, and anywhere you go next. Melissa: I’d add that the long cycle makes us AEs more customer-obsessed and bought-in from the start, because we’re working long-term with a person we may have cold-called many times. 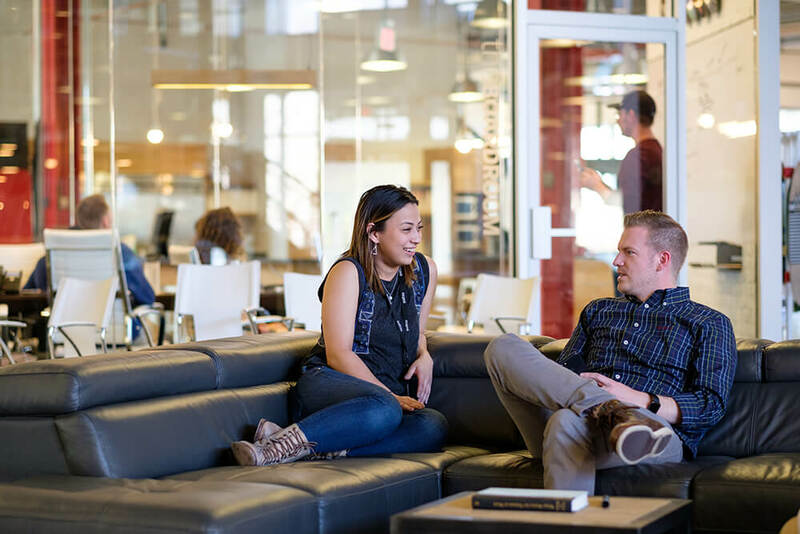 We’re dedicated to their KPIs and we understand how Qualtrics can meet their needs. We become an integral partner for their organization. 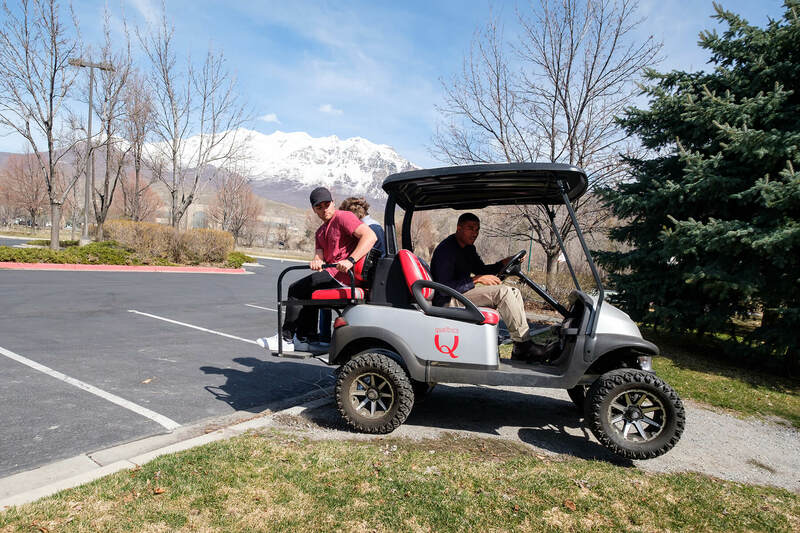 Above and below: Team members head to a local pizzeria via golf cart. 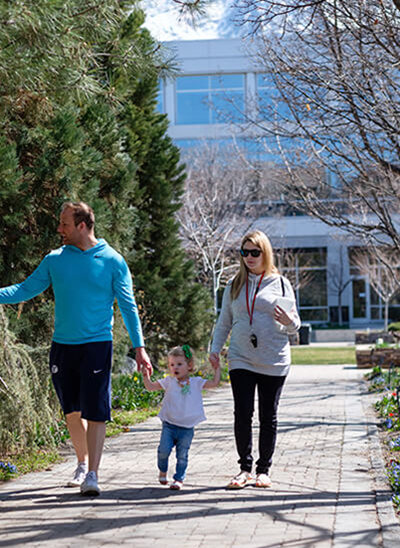 Nothin’ like a post-lunch stroll to get past that food coma. 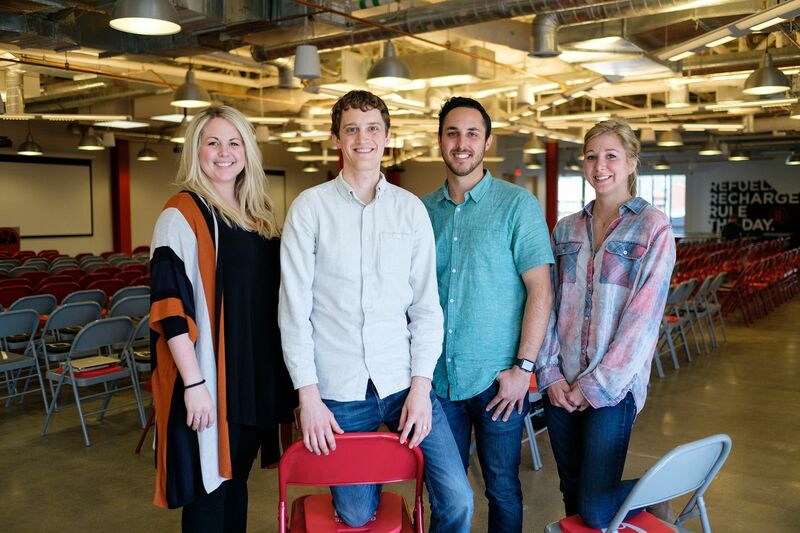 Let’s talk about how you ended up at Qualtrics. What were you doing before? Melissa: My first job out of school was selling advertising, anything from print to search engine optimization. Once I was promoted to enterprise accounts, there wasn’t a lot of room for additional growth, and it wasn’t challenging. I just got bored. I wanted to get into the tech world, and I was also looking for a company that really cared about its employees. 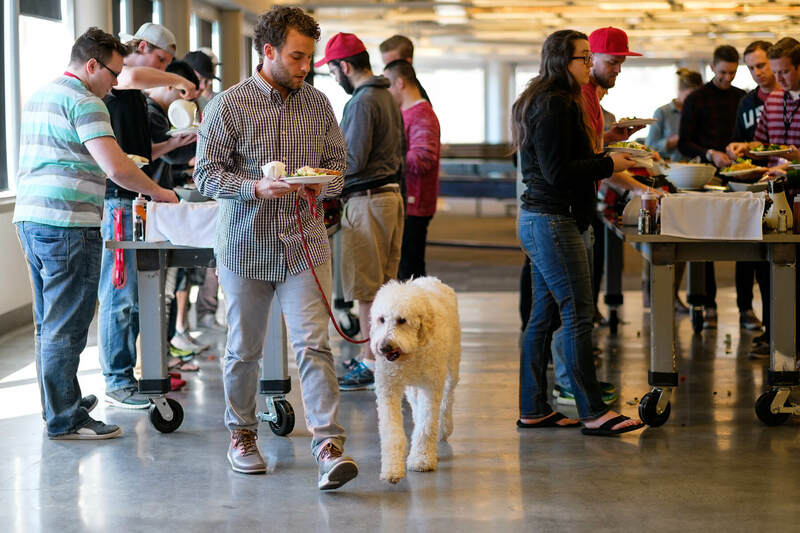 Qualtrics has this incredible culture, even as we’ve grown. At other companies, they say it’s “work hard, play hard,” but in reality, it’s one or the other. 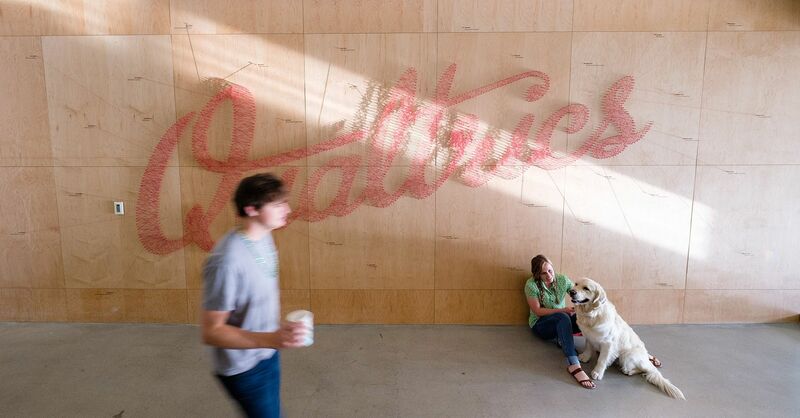 Qualtrics actually embodies both; it’s nice to work somewhere that’s challenging but always fun, too. George: A major food company recruited me out of college, and I managed one of their operations teams. They were great, but two things led to my departure: I was exerting a fraction of my brain power to do my job, and the average of what people around me wanted to accomplish was relatively low, which eventually lowered my own ambitions. 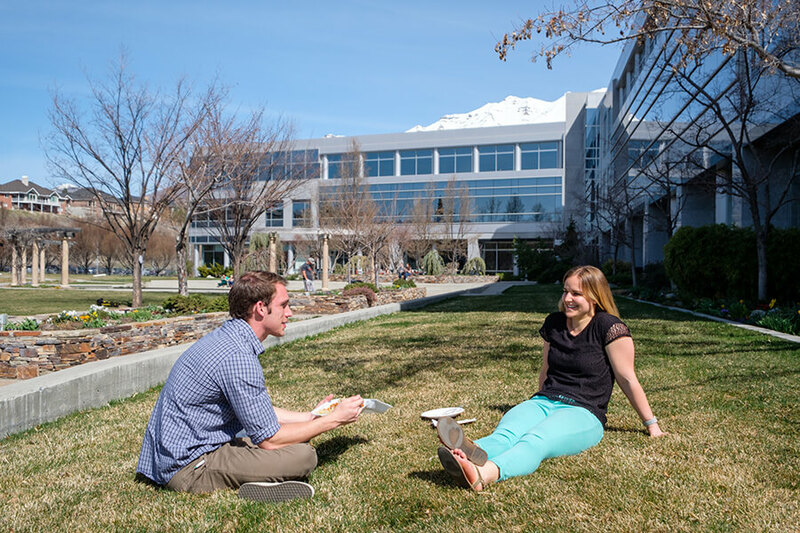 At Qualtrics, I can dictate more of my future, instead of waiting for management above me to either die or retire. Abe: I was a branch manager for a security officer company before I came here. I did all the recruiting, hiring, and payroll; new business development was only about 10 percent of my job. But that 10 percent, the sales aspect, was my favorite part. What qualities make someone successful on this team? George: It’s important to have a strong motor and a self-imposed high bar. You should also be curious. This isn’t a place to wait for success to come to you. But if you work hard, learn from those around you, and take ownership of your success, there’s no reason you can’t kill it. Abe: Being resilient is also important. Some people will come here and work so hard, but they get frustrated — maybe they haven’t hit a quota in their first year — and we lose them. These longer deal cycles and more complex sales require patience and a thick skin. You’re not always going to get an immediate reward or instant satisfaction, so people who can handle adversity do very well. It’s also important for someone to recognize areas where they can improve, and we work on that together. Someone we’ve hired from another sales job may excel in one area, but then the management team needs to teach them the parts of the process they’ve never worked with before. Melissa: Ambition is essential, too. 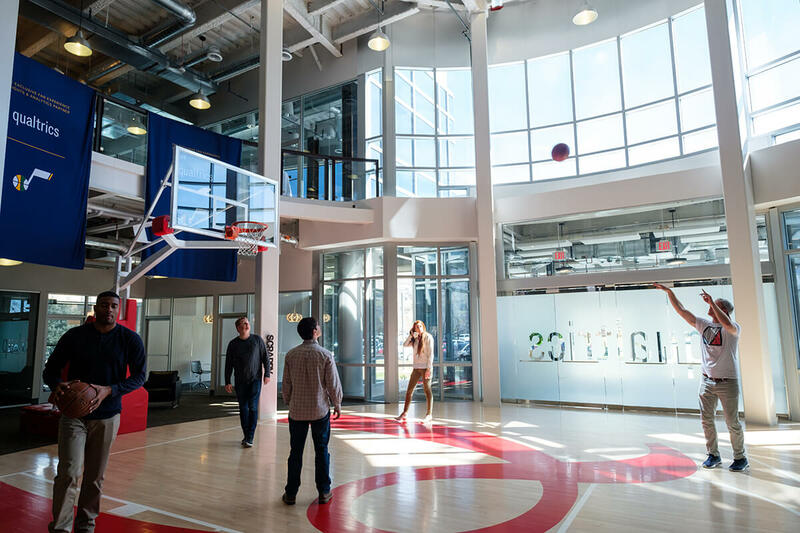 You’ll have a lot of teammates with similar experiences; they all arrived at Qualtrics looking for more. 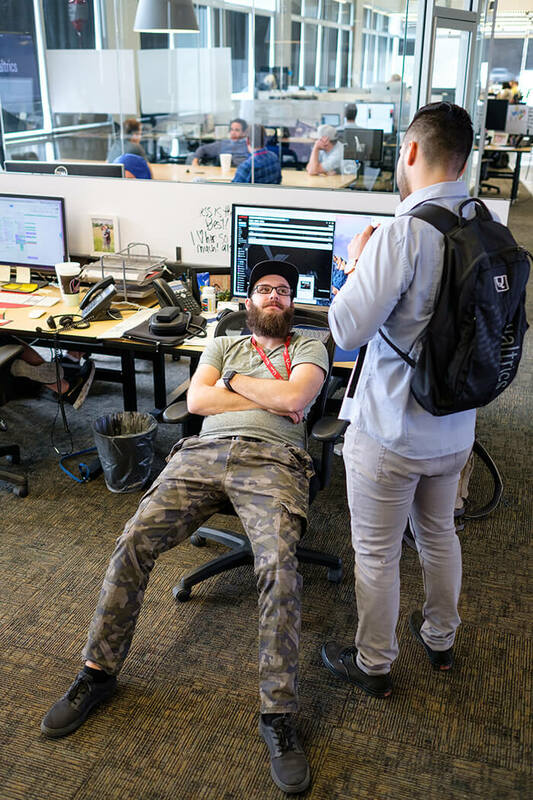 You might have been the smartest person at your last job, but here, you are surrounded by smart people (all of the “smartest person at your last job” individuals) and you realize there’s so much more to learn — and at Qualtrics you want to take on that challenge. Above: Lunch is catered Monday, Wednesday, and Friday. Above and below: Dog-friendly, family-friendly, sports-friendly. Has anything surprised you about the sales process, or convincing people to adopt Qualtrics? Melissa: Having a team and department dedicated to customer experience, for example, is new for a lot of companies. Prospects will tell us, “Yes, we care about our customer feedback and we’re already getting data,” but to then understand the need to extract and act on insights from that data — it’s usually a big step for them. On the other hand, other prospects may already be familiar with it and see the value, but they don’t know where to start or are already working with a competitor of ours. 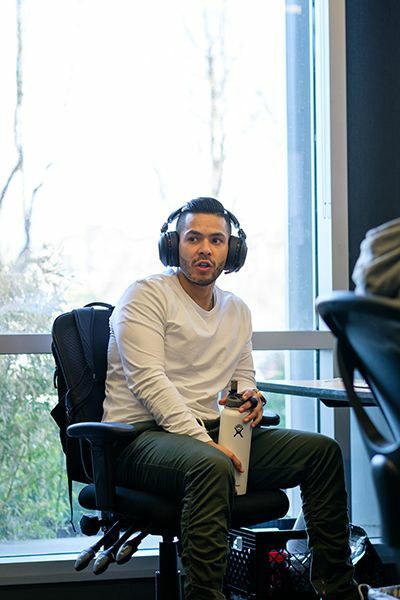 A significant part of what Sales does is educate potential clients about why managing and understanding their customers’ experiences is important, what the solution could look like for their organization specifically, and why Qualtrics is the right vendor. 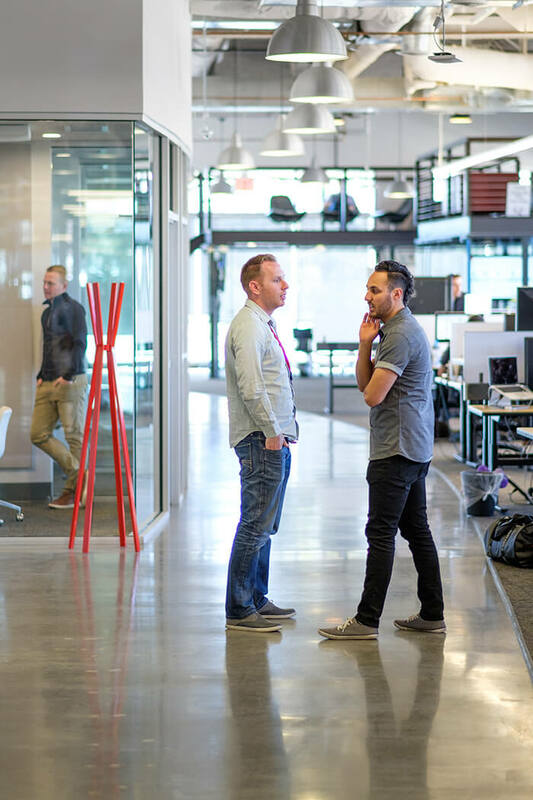 Tell us about collaboration at Qualtrics. How do you work with other departments? George: Sales definitely works closely with Engineering. They arm us with new information we can use to promote the product. 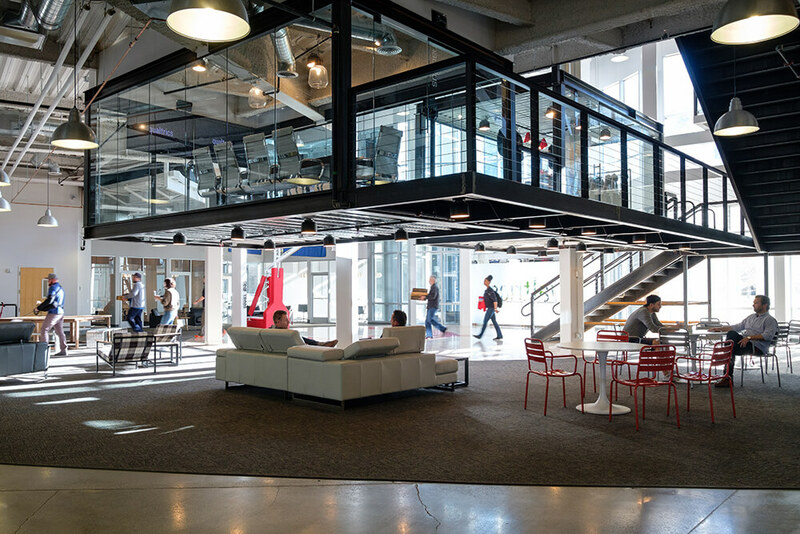 For example, Qualtrics is incorporating a data analysis software we recently acquired, called StatWing, and Engineering has worked closely with us to pilot the integration with several key clients prior to fully launching it to our entire customer-base. On the flip side, Sales passes customer feedback to the Engineering team which is often used in future product or feature development. Many of the components of our platform directly resulted from customer input. I definitely think that Qualtrics does a good job of closing the gap between Sales and Engineering. Melissa: Engineering also follows up with Sales a lot, to keep up-to-date on customer feedback and changing needs. And if we happen to lose a client, we get surveys asking us for feedback as to why, which also gives other departments the opportunity to learn and adapt as needed. George: I remember years ago when Jared Smith, one of our founders, sat down with a group of us at lunch and went through several specific deals, asking, “Why are we losing deals?” “Who are we losing to?” “What within our product needs to improve?” It was very interesting to see how dedicated Jared was to making the product better, and using Sales input to drive the change. Shortly after, we saw much of what was discussed that day (coupled with several other discussions with similar groups, and within our Engineering team) rolled out as product enhancements. Abe: Everyone knows which teams make which decisions. Ryan Smith is the face of Sales. Jared’s the face of Engineering. They interact constantly and their respect for each other is clear. When they talk about Qualtrics’ successes, they always defer to the different functions, not just their own. Melissa: Our leadership understands what they’re trying to build. They’ll take entry-level recruits out to lunch or dinner, and that access and familiarity translates into our day-to-day, too. You see it across the company; I’m an AE3, and someone senior to me is just as eager to help me on a deal as they are to help an SDR. Above: Team members choose a variety of postures for fly-by meetings. Above and below: Bridge the gap, use the Force, hang that hat! There’s obviously a financial incentive for selling, but is success recognized outside of pay? 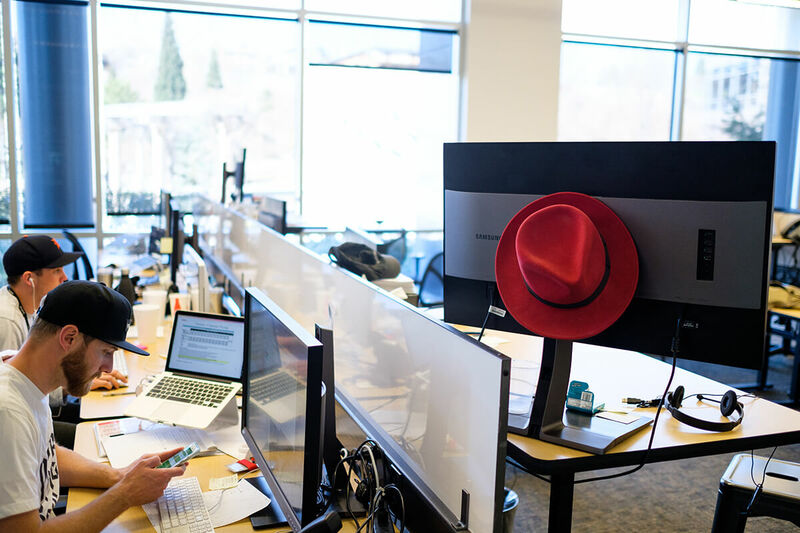 In a nutshell, what makes Qualtrics different? Melissa: One of the things we say around here is that you don’t get extra credit for doing it alone. Even if you’re running the meeting, you’re encouraged to bring in your team lead or region lead to hear their take, and to provide you with feedback that will enable you to continuously improve. You get a ton of support, and getting different points of view helps you grow every day. Abe: I think the environment is second-to-none in setting you up for success in the future. The company really helps you develop professionally, whether it’s as a salesperson, or working with other teams, or taking on more responsibility. You can grow more here in four or five years than most people do in their entire career.